Make this easy baked chicken breast casserole recipe in under 45 minutes! 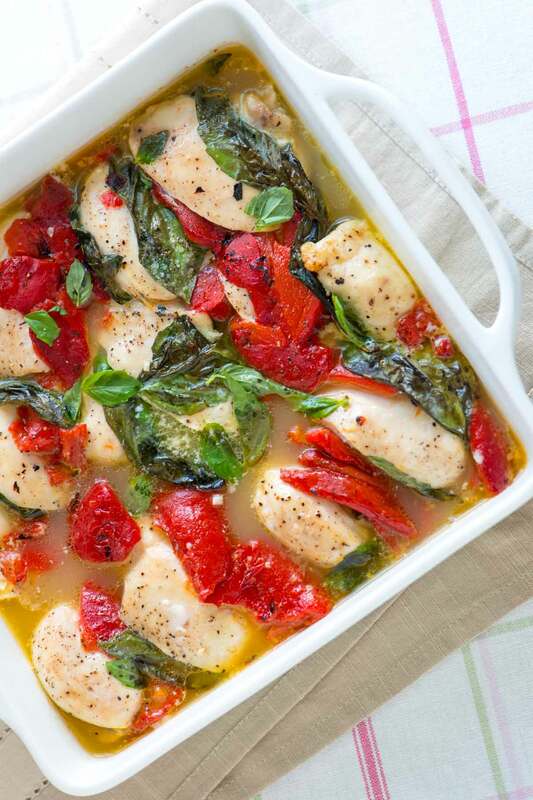 Fresh basil, roasted red peppers, orange juice and lemon make this recipe a keeper. Jump to the Baked Chicken Casserole Recipe or read on to see our tips for making it. We always have a jar of roasted red peppers in our pantry. We love how versatile, colorful and flavorful they are. We’ll often add them to salads, sandwiches, snacks, dips and even casserole recipes. One of those jars was the inspiration for this easy baked chicken recipe. The bright red color of the peppers make the casserole jump of the table. 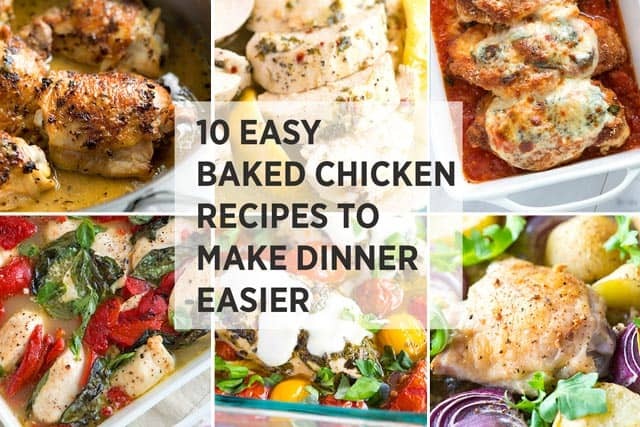 YOU MAY ALSO LIKE: Make meal time a breeze with these 10 easy baked chicken recipes! Featuring lemon chicken, chicken parmesan, easy baked chicken thighs and more! Jump to all 10 Recipes. This casserole is very simple to make and jumps off the table. Along with the peppers, we add fresh basil, orange juice, lemon juice, and garlic. The casserole comes together in minutes and is perfect served with a side of rice, mashed potatoes, or mashed cauliflower to soak up all the extra (and flavorful) cooking liquid. 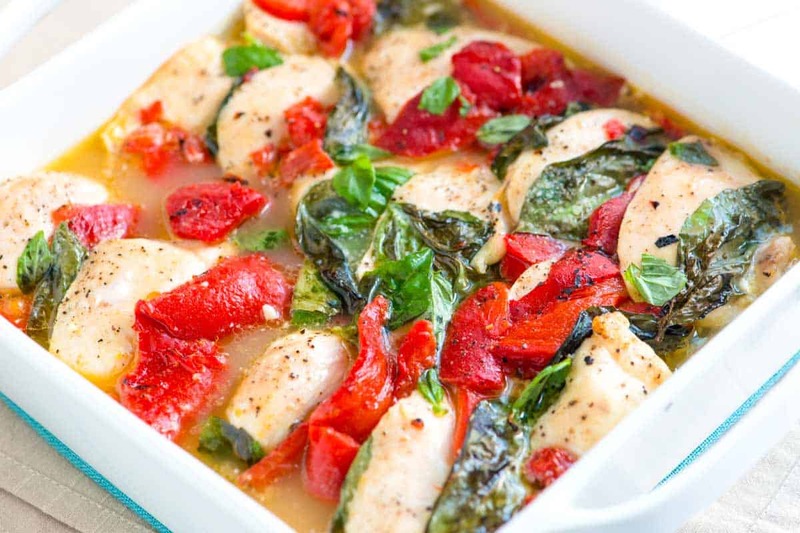 To make it, line up sliced chicken breast, jarred roasted red peppers and fresh basil leaves. Then pour in a mixture of orange and lemon juice. The juice keeps the chicken incredibly moist and makes such a delicious cooking liquid. Then bake in the oven for about 30 minutes. See how there is still lots of liquid? That’s why we always serve with something that will soak it up — that liquid is pure gold! 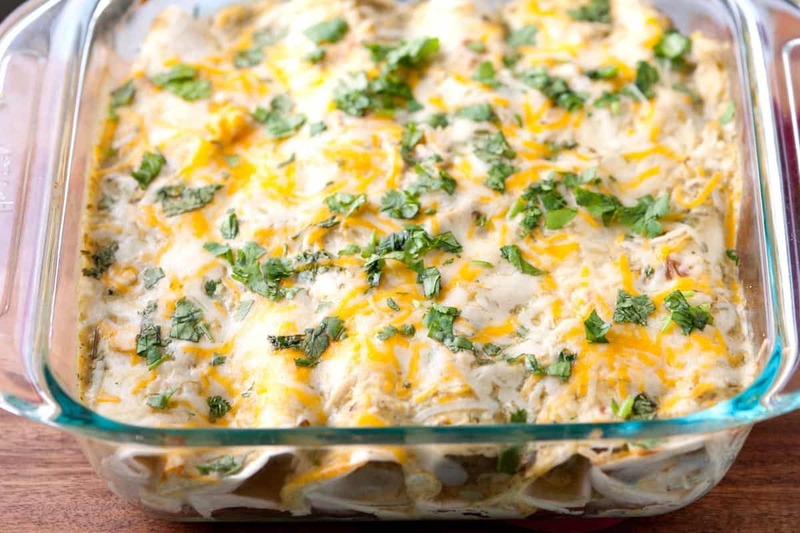 YOU MAY ALSO LIKE: It’s so simple to make this chicken enchiladas recipe with salsa verde, chicken, sour cream, cheese and cilantro. The perfect quick and easy dinner. Jump to the Chicken Enchiladas Recipe. This simple baked chicken recipe is perfect for busy nights. When you serve it think about serving with rice or mashed potatoes (vegetables work, too). 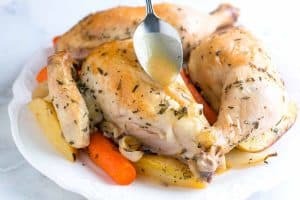 The chicken is cooked in lots of cooking liquid made from orange juice, lemon juice and garlic, so when you serve the chicken you can spoon lots of that same cooking liquid over the chicken and any side dish. It’s delicious. Slice each chicken breast on an angle into 1-inch slices and season with salt and pepper. Open jar of roasted red peppers, drain, and then cut the peppers into smaller chunks. (Try to make them the same size as the basil leaves). Scatter garlic in the bottom of a 2-quart baking dish. Pour half of the orange juice and half of the lemon juice mixture over garlic. 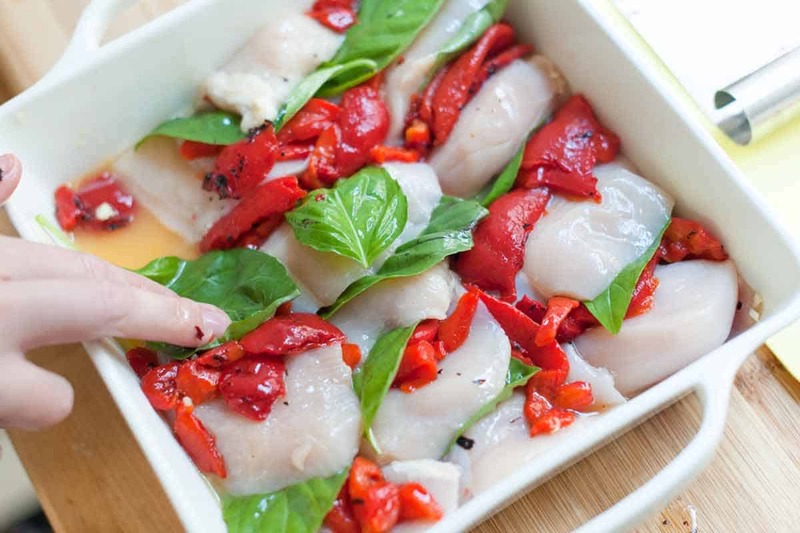 Starting in one corner of the baking dish, alternate chicken slices with pieces of roasted red pepper and basil leaves then pour the remaining orange and lemon juice over chicken. Cut butter into small squares then scatter over chicken. Bake the chicken until the chicken is thoroughly cooked (if you have a thermometer, when inserted into the chicken, it should read 165 degrees F); 20 to 30 minutes. Serve chicken over mashed potatoes, rice or vegetables. There will be lots of extra cooking liquid to spoon over the chicken. One 12-ounce jar of roasted red peppers usually contain 1 very large or 2 medium peppers. Excellent recipe. 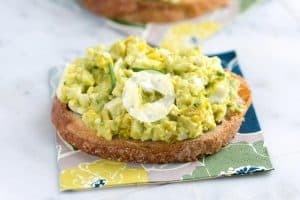 Very tasty and colorful and quick and healthy. What more could you ask for in a recipe. The only tip I have is don’t by the living basil just buy the packaged stuff or wait till Summer and grow your own. I know it may be a silly question but would thin chicken breasts work too? Hi Cathy, Thinly cut chicken breast or small chicken breast will work just fine. 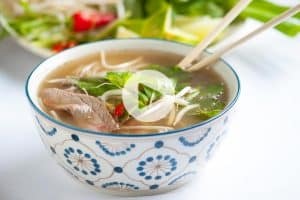 Quick, easy & delicious! I used dried basil because I didn’t have fresh. Just sprinkled some on. I think next time I would try it without the butter to see how it compares. The sauce is so fresh with just a little tang that I don’t think I would miss the butter! BTW, my hubby is a Cordon Bleu trained chef and I try to impress him occasionally. Making this tonight! Sounds delicious! Thank you. Should I cover it with foil in the oven while baking? Great! There is no need to cover the dish. This is my first time trying a recipe on this website and this chicken came out AMAZING!! Definitely a big hit with my boyfriend. The acidic taste wasn’t very overwhelming which was my concern but it was the perfect amount of orange juice and lemon juice! Wow! This was so incredibly fresh and delicious tasting! There werent any leftovers and lots of requests for a repeat performance very soon :). I sliced the breasts about and inch thick and marinated them in the juices and garlic for 15 minutes. I used two tablespoons of lemon juice, and tripled the basil. I drizzled about 1.5 tablespoons of garlic infused olive oil over the top before baking. I thought it would be tasty but it was exceptional. As we were eating, I noticed the bites with basil had an extra yum factor so I would definitely triple the basil again. Thank you for delighting us with this recipe. I will definitely try more from InspiredTaste! Sure! Any veggie will work! Delicious! I wish I would have marinated the chicken for a bit in the juice, because it was so tasty and would have loved the chicken to pick up a bit more of it. I did take advice from previous comments regarding sourness and used only about 2 tablespoons of lemon juice, otherwise kept all other ingredients the same. Served with the whipped potatoes recipe I found here too! Hi there — we’d guess 2 medium peppers. A dry white wine or lighter red (like Pinot Noir) would be nice. can i use other peppers too or just red? Any roasted bell pepper will work well. Can I do balsamic vinegar with the lemon instead of Orange juice? That could be really tasty. We suggest tasting the lemon and balsamic together before adding to the chicken to see if it seems too acidic. You might want to compensate with a little honey/sugar/maple syrup. This was way too sour! I added extra garlic to the bottom of the baking dish and marinated the chicken with the juices during cooking so the basil didn’t get crispy. I like the idea of layering the roasted peppers and basil, but next time will not add 1/4 cup lemon juice. I was just too much for my taste. Hi Karin — Next time, try a little lemon zest and not juice. That should tone down the sourness of the lemon. This looks delicious. I would really like to try this out. Would it still taste good w/out the orange juice? I’m on a sugar detox and Orange juice has too much sugar. Thank You! Yes, leave it out completely or add a little fresh lemon juice — about half a lemon should do it. Orange and lemon zest would also work nicely to add the citrus flavor without the sugar. I dont have roasted pepper in my country. Do you have a substitute in mind? You can roast your own peppers — to do this, turn your oven broiler to high then place regular bell peppers underneath it (it is helpful to place them onto a baking sheet to catch any juices). Roast the peppers for 3 to 5 minutes on all sides or until the skin has blistered and darkened. Then, transfer the peppers to a plastic bag or bowl that can be covered. Leave the peppers for 10 to 15 minutes. In this time, they will steam and then cool. From there, you can easily pull the skin away from the pepper flesh. Remove the seeds and you have homemade roasted peppers. We show you how to do this in our Roasted Pepper Hummus recipe. What do you think about using 1-2T olive oil drizzled over the top instead of butter? I love this recipe so much. I’ve made it a few times and my family always devours it. Thanks! This recipe is incredible, thank you so much for posting it! The flavors blended together in pure perfection. We had it over egg noodles with a side of broccoli. I’m definitely adding this to my repertoire. 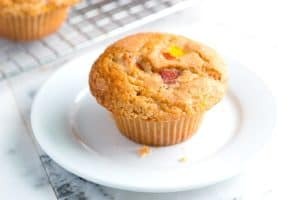 I tried this recipe the other day, after finding it at tastespotting.com. I thought it was a really great recipe! Brilliant in both being easy, quick to prepare and full of yummy flavors. Thank you!